Home / Engagement-L'Chaim/Vort / Classic Basket- Free Shipping! Brent and Sam's cookies,dark chocolate,honey,herbal tea,pareve gift platters of cashews,apricots,pistachios,dried fruit mix,jellybeans,chocolate nonpareils,and apple juice,chocolate covered raisins comprise this wonderful kosher gift basket for the holidays or a thank you gift! We'll ship the gift basket nationwide or deliver it to Highland Park,Edison,East Brunswick or New Brunswick. 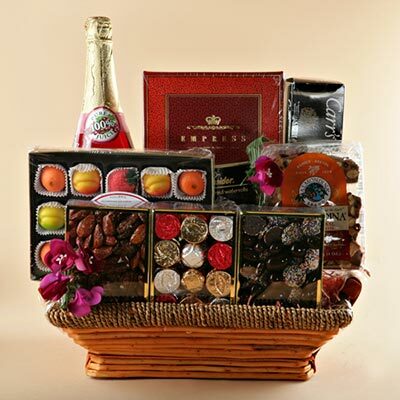 A gourmet gift basket containing dark chocolate truffles elegantly wrapped in colored foil, chocolate bridge mix, honey glazed almonds and pecans, marzipan, crispy crackers and premium juice. A stunning kosher gift basket! Order today, we ship throughout the US and deliver locally! Charming Basket - Free Shipping! 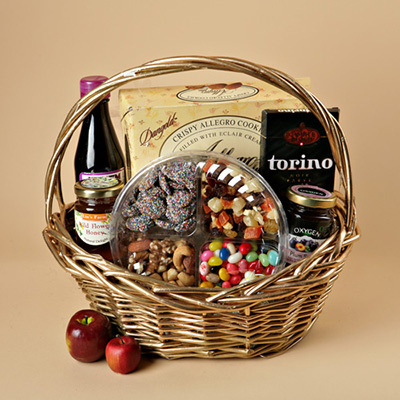 A wonderful kosher gift basket containing a gift platter of mixed fruits, mixed roasted nuts, jelly beans and chocolate nonpareils, grape juice, plum sauce, dark chocolate bar and honey. A very sweet gift!